Duke it out with every faction from Warhammer 1 and 2 next week. On October 26, Total War: Warhammer 2 is getting a free update that will stitch its campaign map together with the first game. Called Mortal Empires, this grand campaign will include all 35 playable legendary lords and a whopping 117 starting factions from both Total War: Warhammer games in a massive battle royale to see which can reign supreme. Today, Creative Assembly revealed the final layout of the mega-map, including where each faction's legendary lord will spawn. 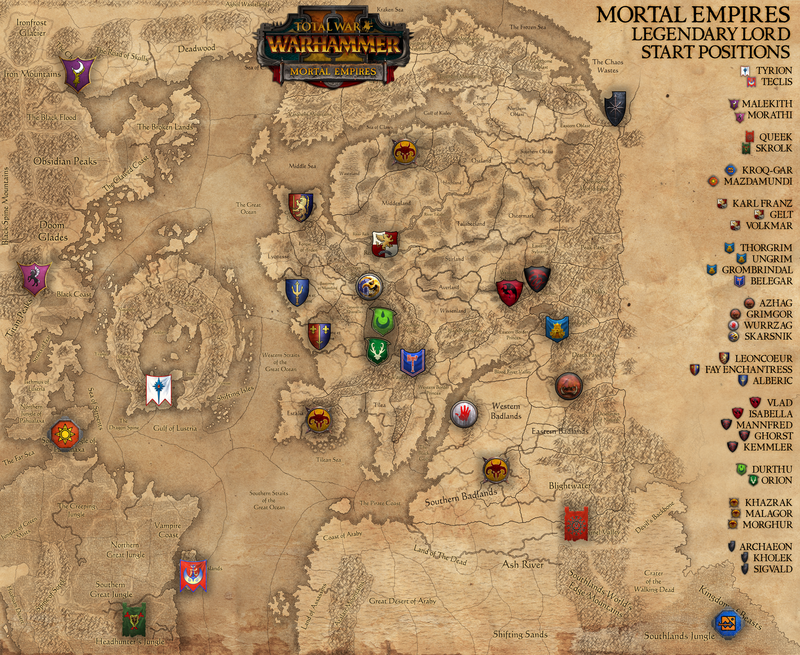 If you've played Total War: Warhammer, you'll already recognize the layout of the map and how the two are stitched together, with Warhammer 2's factions on the left and Warhammer 1's on the right. From the looks of it, it's easily the biggest campaign map I've seen in a Total War game, but players have noted some big, empty spaces—especially in the south-eastern desert. That's where the rumored Tomb Kings faction will probably spawn assuming guesses over what the new DLC factions coming in Warhammer 2 are correct. Mortal Empires is due out next week and you'll need to own both Warhammer 1 (and its DLC factions if you want to play as them) and Warhammer 2 on Steam in order to enjoy it. Thankfully you won't have to install Warhammer 1 again.